Harley McCord , Jr. was born on 25 May 1923 at Brookings, Brookings, South Dakota, USA.1 He died on 1 July 2008 at age 85. Calvin Rogers McCord was born on 11 November 1924 at Brookings, Brookings, South Dakota, USA.1 He was born on 15 November 1924 at Brookings, Brookings, South Dakota, USA. He married Eileen Merrilyn Plath. Calvin Rogers McCord died on 7 February 1999 at Minneapolis, Hennepin, Minnesota, USA, at age 74. Samuel McCord was born circa 1822 at Pennsylvania, USA.1 He married Eleanore unknown in 1842. Samuel McCord died on 4 August 1862 at Iowa City, Johnson, Iowa, USA. He FamilySearch ID # LZ21-7L2. He and Samuel McCord There were two Samuel McCords in Johnson Co. Iowa. The one married to Martha Barr was born 17 Mar 1817 and died 9 May 1886. Based on the book History of the Barr Family 1901 available on Google Books. Samuel McCord born 17 March 1817, who lived near McAlevy's Fort, PA and married Martha BARR on 4 March 1851. The one married to Eleanor ? 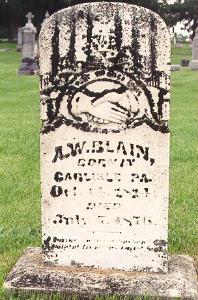 was born c 1820 and died cir 1863. Samuel McCord appeared on the census of 1 July 1854 at Iowa City, Johnson, Iowa, USA. [S703] Sep 1850 Federal Census, unknown repository address. [S702] "Iowa Cities First Families." [S836] 1854 Iowa State Census, http://iagenweb.org, IAGenWeb Census Project. [S1113] Unknown document; unknown film. Archibold Worley Blaine was also known as A. W. Blaine. He was New Tag Quitclaim to John West from A.W. Blain, 8 June 1853 for 28 acres east side se 1/4 of sw 1/4 Sec 12, Twp 81N R6W, Book 10, p. 146 on 8 June 1853 at Solon, Audubon, Iowa, USA. Archibold Worley Blaine appeared on the census of 4 June 1860 at Big Grove Township, Johnson, Iowa, USA.3 He Excise taxes in Div. No. 1 of Collection Dist. No 4 of the State of Iowa, Johnson County, were collected from A W Blain at the rate of .5 on Income of $551, taxes due were $27.55. Original data: Records of the Internal Revenue Service. Record Group 58. The National Archives at Washington, DC. in 1865 at Johnson, Iowa, USA. [S837] 4 jun 1860 Federal Census, unknown repository address, 1860; Census Place: Big Grove, Johnson, Iowa. [S838] 25 Aug 1870 Federal Census, unknown repository address, 1870; Census Place: Big Grove, Johnson, Iowa. [S903] Probate Files - BLAIN, Charles U unknown file number. [S861] 1 jun 1870 Federal Census Mortality Schedule, unknown repository address, United States. Nonpopulation Census Schedules for Iowa, 1850-1880. Drusilla McCord was born on 6 December 1842 at Pennsylvania, USA.1,2 She married Oliver J. O'Keen on 30 July 1859 at Johnson, Iowa, USA. Drusilla McCord married Oliver J. O'Keen on 7 August 1859 at Johnson, Iowa, USA.1 Drusilla McCord died on 4 May 1903 at Polk, Iowa, USA, at age 60. She died on 5 May 1903 at Crocker, Polk, Iowa, USA, at age 60.1 She was buried on 6 May 1903 at Union Cemetery, Ankeny, Polk, Iowa, USA. [S424] Census, 1870, IA, Johnson Co, Graham Twsp Page 12. [S424] Census, 1870, IA, Johnson Co, Graham Twp, Page 12. Cassius L O'Keen was born on 25 August 1860.1 He died on 30 June 1895 at Union Cemetery, Polk, Iowa, USA, at age 34. [S862] Unknown, "Family Report on OKENN Family." Burtis O'Keen was also known as Burt. [S987] Burt O'KEEN, Death Certificate - O'Keen, Burt 1868-1940. Charlie O'Keen was born in May 1872.1 He was born in 1873. 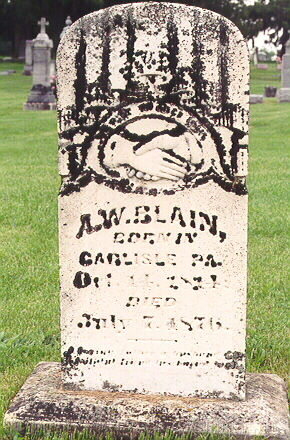 He died in 1941 at Union Cemetery, Ankeny, Polk, Iowa, USA.